Your television is surrounded—maybe you have a Roku or Apple TV, a game console or three, a DVD player for old time’s sake, perhaps a cable box if you haven’t cut the proverbial cord. Cutting out actual cords with all of those electronics in tow? Good luck with that. Hiding a terrifying web of wires behind an entertainment center is no big deal, but what if your flat screen is mounted to the wall, or you’re running a projector from the ceiling? The Aries Pro was created for such needs. 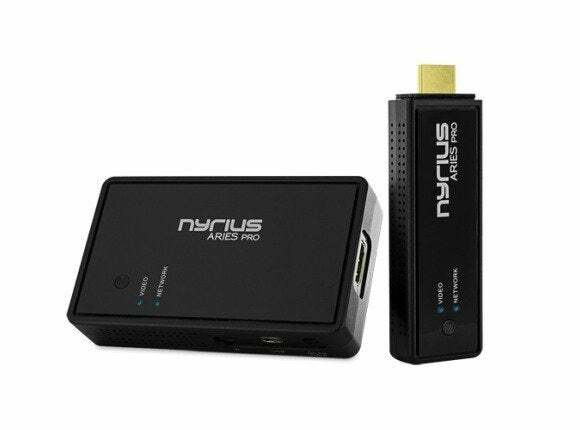 Effectively replacing potentially lengthy HDMI cords with wireless signals, this little peripheral allows you to transmit video or gameplay from your computer or console to your television/projector at a distance of up to 160 feet away. It’s an impressive feat, and by and large, and the video and audio quality is fantastic: the majority of the time, there’s no perceivable difference from being hard-wired, and zero noticeable input lag slowing down your gameplay or menu maneuvering. Brief moments of digital artifacting occur, however, as do occasional connection hiccups, which can frustrate—especially considering the price. The setup process takes a few minutes, but it’s pretty straightforward. On one end is the receiver, a small black box that hooks into your TV via HDMI and is powered by an AC adapter. Feeding into that is the wireless transmitter, which is slightly larger than a USB drive and plugs into the HDMI port on your laptop, desktop, or game console. A USB cable must be plugged from the transmitter into your device to provide power, but luckily, everything is provided in the box. The larger piece on the left connects to your TV with an HDMI cable, and the dongle on the right is for your laptop, tablet, or game console. If your computer doesn’t have a built-in HDMI output, you may be able to use an adapter (not included); in my case, I used one to link the Aries Pro transmitter into the Mini DisplayPort of a first-gen Surface Pro, and it worked without a hitch. And if the transmitter won’t fit perfectly into your device’s HDMI port without blocking other inputs, there’s an included right angle HDMI adapter that changes the orientation of the transmitter—which is ideal for the back of a game console. That might sound like a fair bit to sort out, but it’s really rather simple; and once done, all you need to do is turn on the TV, fire up your device, and the signal should appear on your display. And it’s effectively plug-and-play, so if you want to switch between devices at any time, simply unplug the transmitter and USB cable from one and pop it into another. The Aries Pro delivers a crisp and vibrant 1080p HD signal (and supports 3D), whether you’re transmitting video footage, surfing the web, or playing games. And whatever the case, I didn’t notice a hint of input lag during use, meaning frantic, twitch-based shooters and other tense games are just as playable as slow-paced puzzlers. The device leaves you feeling in full control, which is essential for it to be useful. The visual differences may not be significant, but they are there. In particular, you’ll catch instances of visual artifacting, such as a line of small colored blocks appearing for a moment here or there, or menu buttons left looking fuzzy for a moment when moving between selections. You might catch a sudden bit of fuzziness while playing games, as well, such as when taking a quick turn in a racing game (as I did playing Forza Motorsport 5 on Xbox One). That’s disappointing, but it’s only ever for a half-second or so. A bigger issue comes with the rare, but irritating moments when the transmitter and receiver lose touch for a second or two. I saw it happen a couple of times during several hours of use, and it’s sudden and severe enough to get you killed in an online shooter, or send you careening straight into a wall in a racer. That’s a trade-off that comes with using wireless technology, and a caveeat for very competitive gamers who might lose their cool over such a mishap. The Aries Pro works well for streaming online video from a laptop to your TV. It’s also important to note that the device is not compatible with the Wii U, due to the console’s second-screen GamePad using the same wireless spectrum as the transmitter. Mario Kart 8 looks fantastic running on a big-screen TV through the Aries Pro—for the brief moments when it’s actually working. However, the signal drops repeatedly, and even the controller becomes disconnected from the console with regularity. While an understandable issue specific to such a unique platform, it’s a disappointing compatibility omission, and it’s not clearly noted on the website or packaging as of this writing. Considering the price of the Aries Pro, occasional visual and connectivity issues are disappointing. But there’s real value to such a versatile device, whether you aim to run laptops to a projector at work, stream your media collection from your desktop in your den to the living room big screen, or simply link up a console to a TV without a ton of cords dangling below. Very minor visual degradation and occasional signal drops are a trade-off for the Aries Pro’s wireless connectivity, but it’s a mostly tolerable one for those looking to avoid masses of dangling wires—especially projector users. If performance is your sole priority (especially when playing video games), stick with an HDMI cable and deal with the unsightly cords; otherwise, the Aries Pro finds a nice middle ground between form and functionality. The Aries Pro lets you transmit video and gameplay to a TV or projector from afar—with mostly impressive results.